You can download eclipse from http://www.eclipse.org/downloads/. The download page lists a number of flavors of eclipse. The capabilities of each packaging of eclipse are different. Java developers typically use Eclipse Classic or Eclipse IDE for developing Java applications. The drop down box in the right corner of the download page allows you to set the operating system on which eclipse is to be installed. You can choose between Windows, Linux and Mac. Eclipse is packaged as a zip file. Using any one of these tools, extract the contents of the eclipse zip file to any folder of your choice. When eclipse starts up for the first time it prompts you for the location of the workspace folder. All your data will be stored in the workspace folder. You can accept the default or choose a new location. 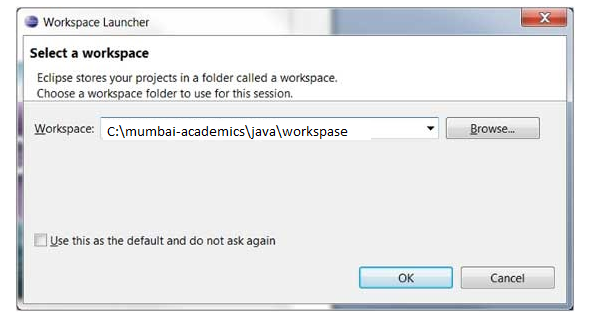 If you select "Use this as the default and do not ask again", this dialog box will not come up again. You can change this preference using the Workspaces Preference Page. See the Preference tutorial page for more details.